← The Sports Archives – The World’s Most Dangerous Ski Resorts! The Sports Archives – Ichiro Suzuki: Still Kicking It! Ever since Ichiro Suzuki came from Japan to the United States in 2001 to play Major League Baseball, he has brought his own star with him. Ichiro – he is known by his first name, not his last – made a splash right from the beginning, winning both Rookie of the Year and the American League Most Valuable Player in his very first season. He also won a Gold Glove and a Silver Slugger award, and was elected to the All-Star Game. After that first year, Ichiro continued to impress, and was elected to the All-Star Game every year from 2001 to 2010, and won Gold Gloves every year as well for his stellar outfield defense. The lead-off hitter led the league in games played, plate appearances, and at-bats for most of the seasons. More importantly, he led the league in hits seven times, and won two batting titles. In addition, Ichiro was also a base stealing threat, making him particularly valuable in fantasy leagues. 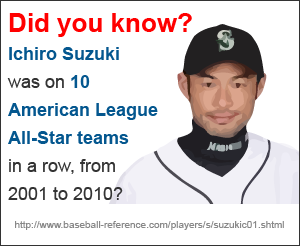 However, Ichiro’s numbers have stagnated in the past few years, as the now-38-year-old star has aged. In 2011, he hit just .272, his first time ever in the big leagues hitting below .300. His base-stealing pace has slowed as well. Also in 2012, Ichiro was hitting even worse than in 2011. And when it comes to fantasy baseball, Ichiro is not a home run threat – he has just 102 career HRs. So you may think that Ichiro is not a good bet anymore for your fantasy baseball team, even for a daily fantasy baseball league. Yet there is something that gave some team owners in fantasy baseball renewed interest in Ichiro’s talents – he was traded in July to the New York Yankees. Not only did the lefty batter move from the last-place Seattle Mariners to arguably the best team in baseball, but the hitter also upgraded when it came to ballparks. Safeco Field is a pitcher’s park, while Yankee Stadium is a hitter’s park, especially for left-handed hitters. In addition, since he is on a better team, Ichiro will most likely score and drive in more runs, since the Yankees’ batting lineup is one of the best in baseball. There is also the fact that for the first time in many years, the outfielder is on a very good team, with something to play for in October. That psychological boost he may get for that is incalculable, but it could be real. Instead of playing for a team that never has a chance, Ichiro is on a first-place team. He also no longer has to worry about being the top star on the team; with the Yankees, he is on a team of superstars, and he is only one name. Since becoming a Yankee, Ichiro has hit 3 home runs and driven in 19 RBI in 53 games, batting .317 at press time, and stealing 10 bases. Most notably, he went 7 for 8 in a doubleheader September 19. This is a significant increase from what he did in Seattle in 2012, where he had 4 homers, 28 RBI, and 15 stolen bases while batting .261 in 95 games. So he does still have a little value in fantasy leagues as the season draws to a close. This entry was posted in Baseball and tagged AL MVP, fantasy baseball, Gold Glove Awards, ichiro suzuki, MLB, New York Yankees, Rookie of the Year, Seattle Mariners, Silver Slugger award, sports and leisure, Sports Archives. Bookmark the permalink. 1 Response to The Sports Archives – Ichiro Suzuki: Still Kicking It!